New, standardized bins feature clear, common signage to make it easy to compost and recycle across campus. The sessions will be held in the Woodruff Library, main level foyer, on Feb. 15, March 15, April 19, May 17 and June 21. Each day will include three sessions: 9-10 a.m., 1-2 p.m. and 3-4 p.m.
Matthew Early, vice president of Campus Services, wants these sessions to ensure that customers’ needs are being met and their operational concerns are being addressed. “We are also going to have items that we are getting a lot of questions about diverting from landfills on site for further training and outreach on where to place and recycle unusual items, such as felt, rubber bands, silica gel packs and more,” Keeler notes. 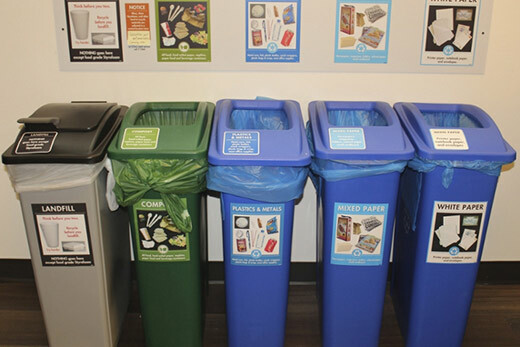 Emory community members can get information on the new waste policy and why Emory has it, where to find out about questionable items to recycle or compost and why you have to service your own desk-side container. Emory’s waste policy aims to divert 95 percent of campus waste from municipal landfills by 2025, effectively a zero-waste policy. The university began transitioning into the new policy in January. A video contest was held to educate about the importance of landfill waste diversion, including the social and environmental impacts of landfills. During the 2016 fiscal year, Emory successfully diverted 55 percent of waste materials from the landfill. This was an almost 5 percent increase from 2015.